The seasonal obsession with pumpkin definitely caters to those with a sweet tooth. Flavored lattes, baked goods, and even the scent from a candle all represent the squash’s affiliation with dessert. While its natural flavor when cooked is mildly sweet, similar to that of butternut squash, the flavor most of us lust after this time of year isn’t really pumpkin at all. The spice squad of nutmeg, cinnamon, ginger, cloves and allspice, collectively known as pumpkin pie spice, are all used to create that notable “pumpkin” taste we’re so familiar with. I’m not one to pass up a pumpkin scone, but I actually prefer mine in hearty recipes, like soups or sauces. This pasta recipe uses autumnal herbs to flavor a rich sauce and coax canned pumpkin to the savory side. Heat olive oil in a pan over medium heat and add sausage. Using a slotted spoon, remove to a bowl lined with a paper towel using a slotted spoon. Heat the same pan over medium and melt in butter with leftover sausage grease. Add shallots, garlic and herbs and, using a wooden spoon, stir together and scrape up any browned sausage bits; cook until shallots just soften. 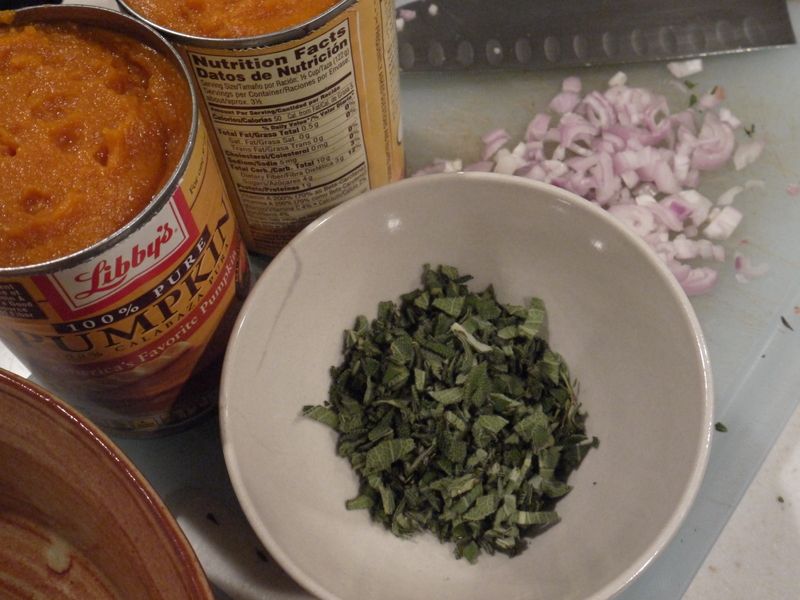 Stir in pumpkin puree and mix until all ingredients are combined. 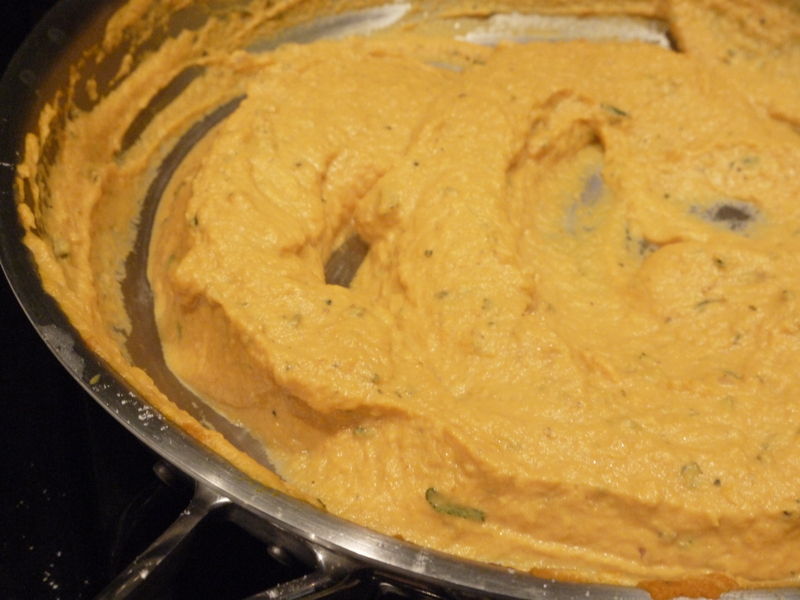 Whisk in heavy cream, then add in cooked sausage until hot. Grate in nutmeg (or use ground nutmeg) and add salt and pepper to taste. Fold in cooked pasta until sauce coats noodles. Serve. The can of pumpkin puree even assumes you’ll be using it to make something sweet: most of them feature a giant, whipped cream-topped slice of pumpkin pie on the label. This pasta sauce, though, trumps any pie, cake or latte I’ve ever had. The combination of sage, rosemary and thyme does for this recipe what pumpkin pie spice does for all of fall’s sweet treats. Sausage grease, which your doctor would probably prefer you to dump, lays the salty base for the team of autumnal herbs to melt into. The beautifully colored pumpkin puree creates a thick sauce, and the heavy cream adds richness to the uncomplicated pasta dish. 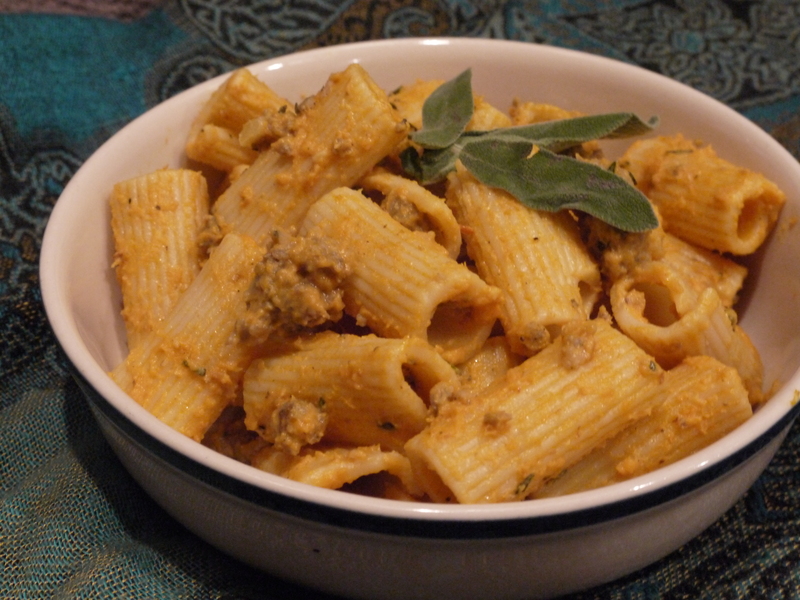 Creamy pumpkin rigatoni with sausage – the savory way to do pumpkin.